Digital culture's hatred of ambiguity was the theme of a post in March last year and since then the search for my inner analogue has led me to the realm between the known and unknown recognised in Sufism as barzakh or the intermediate world, and on to that celebrated guide to the intermediate states the Bardo Thödol Chenmo, aka the Tibetan Book of the Dead. Trilogie de la Mort (Trilogy of the Dead) is a three part work created by French composer, wife of maverick sculptor Arman and Buddhist practitioner Eliane Radigue, seen above. The trilogy was created between 1985 and 1983 using an analogue ARP 2500 synthesizer. Part one, 'Kyema', is inspired by the Tibetan Book of the Dead and invokes "the six intermediate states that constitute the existential continuity of the being". This is followed by 'Kailasha' which portrays an imaginary pilgrimage around Mt. Kailash, the sacred mountain in Tibet. The concluding section 'Koumé' evokes reincarnation but extends it beyond Buddhism in an apocalyptic climax akin to Messiaen's L'Ascension without smells and bells. In a comment on my post 'If you dig Led Zeppelin try this Janáček' music therapist Lyle Sanford recalled the "amazing organ part that was as mind bending as anything in the pop/rock world of the time - or before or after for that matter" of the Glagolitic Mass heard on a 60s LP and the Trilogie de la Mort inhabits the same stomach churning bass registers. With extended drones and pulses this three hour epic is more sonic experience than music - but isn't the ultimate goal of music to be a sonic as well as emotional experience? We are fortunate to have a CD release of the trilogy and a powerful amplifier and extended range speakers produce a truly out of body experience - low frequencies are omnidirectional so the speakers no longer seem to be the sound source, but instead the very walls and ceiling emanate cosmic vibrations. The Arab philosopher and astronomer al-Kindi believed objects and beings in the universe possessed radiations that affected other beings, and before dismissing cosmic vibrations as mystical babbling remember that in empirical science Bell's theorem tells how one subatomic 'object' can instantly affect another particle no matter how physically distant the two particles are. All credit to independent label Experimental Intermedia for releasing Trilogie de la Mort as a 3 CD set in 1998. The endearingly titled Arcane Candy declared Eliane Radigue's trilogy "a beautiful, moving and perfectly rendered minimal epic" to which I can only say amen, or rather om. 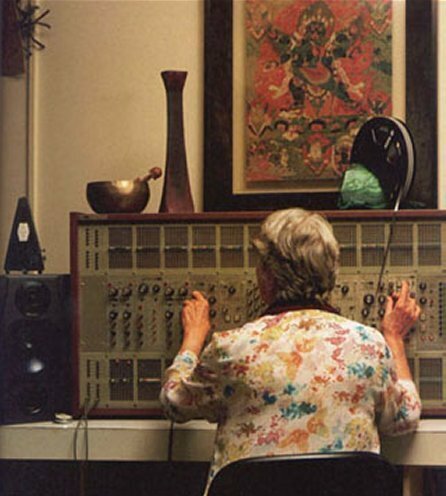 Header photo of show Eliane Radigue at work on her ARP 2500 comes via Zepelim. I bought Trilogie de la Mort online from the States. Any copyrighted material on these pages is included as "fair use", for the purpose of study, review or critical analysis only, and will be removed at the request of copyright owner(s). Report broken links, missing images and errors to - overgrownpath at hotmail dot co dot uk Also on Facebook and Twitter. Thanks for correcting my misnaming of that Janacek piece. After making the comment, thought maybe I'd gotten it wrong. But the amazing thing was, after not thinking of that piece for something like 40 years, I had bits of that organ solo swirling in my brain for days. Your pointing out the power of that music is tied into its use of the low registers fits right into your posts on turning up the bass of "classical" music. For me in this instance, that "stomach churning bass", seems to have wired the piece very deeply in my brain. David Johnson via Facebook - People can't deal with ambiguity and uncertainty, which is where the fun really is me thinks. they must believe something and latch onto it---even atheists think they are unbelievers, but they ain't.